It can be difficult to find products that are both great quality and created ethically for kids, so we were thrilled when Green Bee Toys got in touch and provided us with some lovely items! They have some key principles that more toy companies should really think about taking on board! Unlike standard crayons these are shaped like rocks making them easy for toddlers to grip! They are made from 75% fruit plant with vegetable extract and 25% bees wax meaning they are 100% natural. The Mini Mes (and I) found that these were great for shading in particular and they never go blunt which is certainly useful. Our box contained 6 colours; red, orange, yellow, blue, green and brown. This wooden set will help to develop your child's imagination and motor skills through play. It includes a hammer, bolts, ruler a wrench and more for great role play fun. Although it's suitable for children as young as 3, Jamster at 7 has really enjoyed 'fixing' everything from beds and doors to his other toys! The set itself is storage for the tools so you don't even need to worry about bits going missing. It's great value and great quality. A soft and cute rattle for newborn+ this grasp toy helps to stimulate your little ones senses and build hand eye coordination. The soft fabric, 100% organic cotton, is perfect for delicate skin and the different textures creates variation for your little one to enjoy. The website was easy to navigate and delivery was swift! I was really pleased with all of the products and I'd happily order from Green Bee Toys again. What's even better is that your purchases can earn you points and with 10 equaling £1 you can save money when you shop. Bonus! For your chance to win 1 of 2 £25 vouchers for Green Bee Toys you can enter via the Rafflecopter entry form below. I would put the voucher towards a rocking pony! id put it towards the 5 in 1 cube! Commented on watch bake create transport. Love the baby toy duck. Followed on Blog Lovin, Pinterest and Google+ too! I like the "gripability" of the Baby Toy Cat. I follow on Google+ as Ali Thorpe (itsalit). I follow on Pinterest as Ali Thorpe. 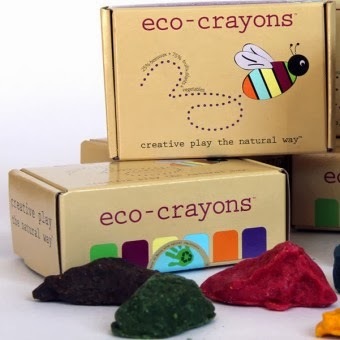 My little one would love the eco crayons as she is currently very into crafts. I like the Fairy Tale Blocks too, my daughter had something similar, not as cute, and she had lots of fun with it. I home educate and this would be so great. A classic train would be wonderful for my little guy. I'd put it towards the wooden kitchen centre. I would buy the Baby Toy Duck for my goddaughter and her parents would also love the fact it is organic! think id put it towards the organic hammocks! I would spend it on some of your arts and craft stuff my children could then share it and both enjoy it. I would buy something for a friend who is a soon-to-be mum. I don't know what she needs yet but probably soft toys! fairytale blocks, although so much to chose from!